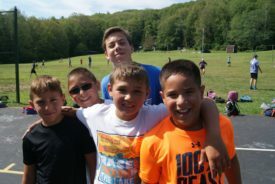 Units are not just age groups but small communities arranged by the camper’s grade entering this fall. Units compete each week for the Spirit Cup by chanting, showing their camp spirit, and overall activity around camp. (3 & 4 year olds not entering K) ratio of 6 campers to 1 staff: Looking to start your campers journey with a half day program, Fun In The Sun (F.I.T.S) is the place to be. 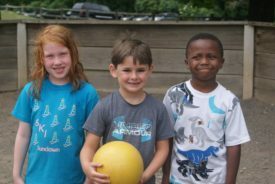 Campers will experience age appropriate activities in their small groups. 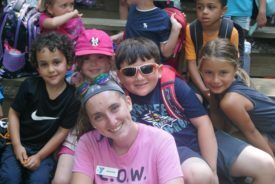 (Entering Kindergarten) ratio of 6 campers to 1 staff: Our youngest campers experience a full day of fun with caring staff that help guide them through their adventures. Camp activities include: swim lessons, free swim, LEGOS, nature/science, arts & crafts, and sports. (Entering 1st & 2nd grade) ratio of 8 campers to 1 staff: The B’s & D’s are excited to add rock climbing to this Unit. A skilled staff person will help them climb the wall and reach their goals in more than one way! Camp activities include: swim lessons, free swim, SK8 Park (scooter), nature/science, arts & crafts, rock climbing, and sports. 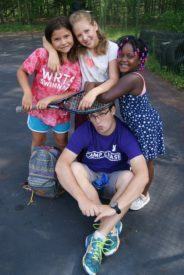 (Entering 3rd & 4th grade) a ratio of 10 campers to 1 staff: Our Rockin’ Rascals will explore camp and experience Archery for the first time. Shooting once a week the kids will learn the basics and take aim. Camp activities include: swim lessons, free swim, SK8 Park (scooter), nature/science, arts & crafts, sports, and rock climbing. (Entering 5th & 6th grade) ratio of 10 campers to 1 staff: “P-U What?”… “P-Unit”! This group loves to show their true camp pride chanting their Unit name as the make their way around the campus. Being introduced to the more challenging features of our Ropes Course, the Pioneers will work together as a team to achieve their goals. Camp activities include: swim lessons, free swim, SK8 Park (scooter), nature/science, arts & crafts, sports, rock climbing, and archery. 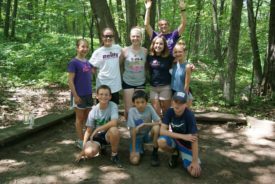 (Entering 7th & 8th grade) ratio of 10 campers to 1 staff: This fun loving and energetic group of campers are some of our oldest here at camp. This means that the Rangers are able to participate in every activity available at camp and more. This program also utilizes our low ropes course to foster team work and a sense of community within the unit. The Rangers participate in a trip every other week to either Mini Golf or River Tubing. Camp activities include: swim lessons, free swim, nature/science, arts & crafts, sports, rock climbing, archery, SK8 Park (scooter), and Mt. Boards. (Entering 9th & 10th grade) ratio of 12 campers to 1 staff: These groups are commonly known as the ITs’ at Camp Chase. 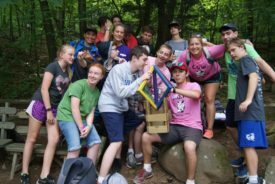 The ITs’ take time to foster leadership skills, accomplish challenges, and develop friendships among campers from around the area.